Chef Umberto Bombana's restaurant 8 1/2 Otto e Mezzo continues to gain more accolades with its three Michelin stars, and still going strong in the Asia's Top 50 Restaurant list. Oh and can we add he has expanded his culinary empire to Shanghai and Beijing? 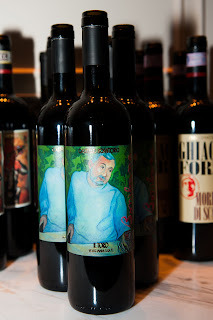 But Bombana has one more thing other Hong Kong restaurants don't have -- his portrait on a wine label. The portrait was recently unveiled at Otto e Mezzo, courtesy the winery Castello Romitorio owned by Italian artist Sandro Chia. He is a well known contemporary artist who was part of the Transavanguardia movement that gravitated back towards figurative painting. Chia counts such artists as Jean-Michel Basquiat, Francesco Clemente and Julian Schnabel. In 1984 Chia purchased the winery and a few years ago asked his son Filippo to oversee management of it. The younger Chia was in Hong Kong for the launch of the label featuring Bombana -- he himself has a MFA in photography at New York University. He also has a strong American accent, but speaks fluent Italian as well. Nevertheless Sandro Chia met Bombana four years ago and the artist came to Hong Kong last year for the Hong Kong Art Fair. It was then that discussion of a possible wine label could be created, as Chia believes art also extends to cooking. While the portrait doesn't look exactly like Bombana, it does bring out his warm personality on canvas. 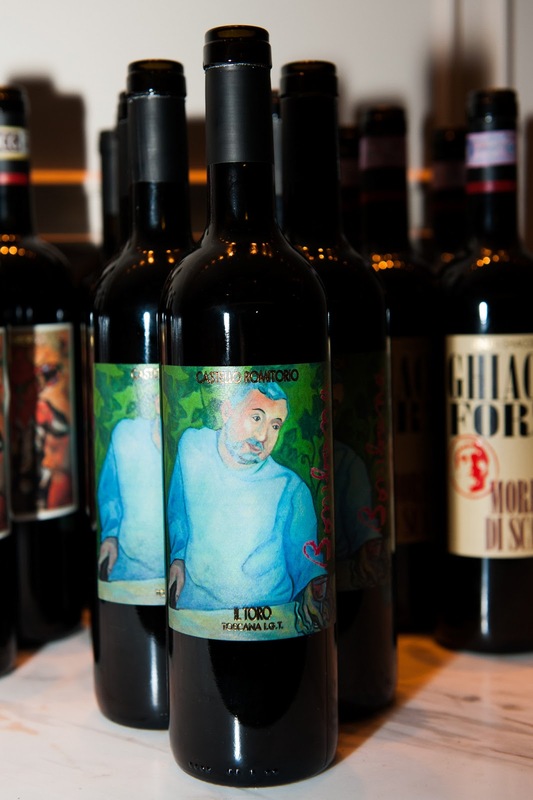 The label is featured on the Il Toro 2009, an easy-drinking red that goes well with most dishes, and of course available at Otto e Mezzo. Bag Lady: Louis Vuitton Speedy Damier Paillettes.